Now You Can Wear Your Car With These Tacky-But-Amazing Leather Jackets! Nightmare scenario: You just overestimated your insane drifting skills and sent your precious Mercedes-Benz flying off a mountain. It's totaled, but you can't bear the thought of living without it. Fortunately for you, modern science has evolved to the point where you can turn your car into a leather jacket you can wear! ON YOUR BODY! A clothier calling themselves Platinum Dirt lets you buy a leather jacket that has been "recovered" from an actual car, including the VIN plate on the breast and a zipper pull made from the hood ornament. They have ones from Lincoln, Cadillac, Mercedes, BMW and Volvo on display. The price is absurdly steep at $1,690, but if you can't bear to part with you car, maybe it's a viable option. 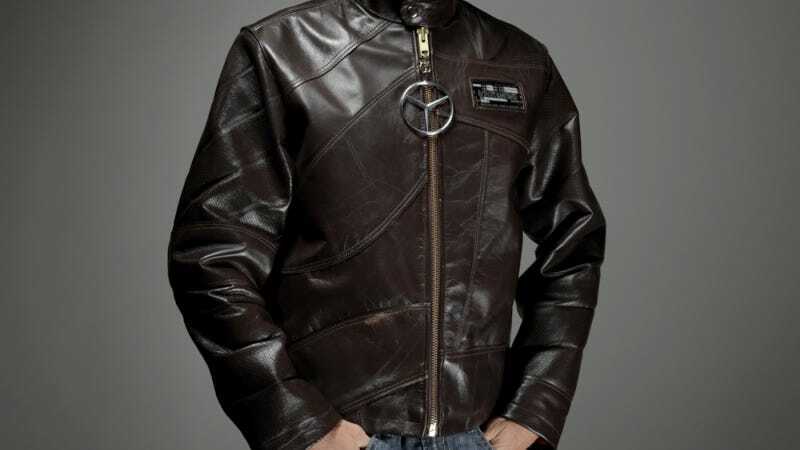 I need to add that like 80 to 90 percent of all leather jackets, these are extremely douchey, and the fact that they're made from cars means you will almost certainly never get laid in one. Ever. Having said that, I still kind of want one, especially if it keeps the heated seat function. That would be kind of nice in the winter.